Czech Beer Festival – A Must Visit Event! Last year I booked my air tickets and took British Airways flights to Prague from London to attend the famous Czech Beer Festival, which is being held every year ever since it was founded in 2008. I had been hearing about this renowned event from my friends, who had already been to this festival in the past years and told me about their experiences and fun moments here. For some reasons, I wasn’t able to make it to the festival either with my friends or individually. But, I somehow managed to visit Prague in 2012 to take part in the beer festival. It was a great experience indeed for me and I will be attending the Czech Beer Festival in 2013 as well. This is a must visit event for beer lovers. I strongly recommend visiting it at least once. You will simply love attending this fantastic event and having great times here. I want to share my experiences at the Czech Beer Festival 2012 so that this may be of a great help to you in preparing beforehand your visit to Prague in the years ahead. Prague is easy to reach from most parts of the world. There are many international airlines that providing cheap tickets. From most European cities, it takes nearly 2-3 hours to reach Prague. However, the flight duration from Asia, United States, Africa are long. Whether you are boarding your flights to Prague from Europe or other continents of the world, you’ll simply love to participate in the Czech Beer Festival year after year. The Czech Beer Festival is the largest beer event in the Czech Republic. Ever since its founding in 2008, the festival has become an instant hit with the native Czech people as well as people from around the world. The people in Czech Republic drink more beer per capita than anywhere else in the world. 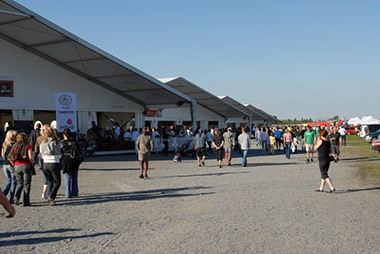 The Czech Beer Festival 2012 was held from May 17 to June 2 at Holešovice Exhibition Center in Prague. This is the most frequented place in the city which Prague citizens love the most to be around. The holding of the Czech Beer Festival here therefore made an obvious choice for the organizers. This was the 5th edition of Czech Beer Festival. The 17-day-long festival was indeed quite eventful with fun-filled moments. I had a gala time here. The visitors to the festival were offered a selection of the best from Czech breweries, chefs, bakers and butchers. I and scores of visitors here got a chance to taste more than 70 brands of Czech beer. The beers were of top quality and were served in glass pitchers by boys and girls donning Czech national costumes. The main focus of the Czech Beer Festival on May 21 was on gay and lesbian beer fans. The festival on May 28 celebrated the burgeoning Vietnamese population in Prague. A mass reunion of Czech expatriates from across the world was the chief feature on the second weekend of the festival, from May 25 to May 27. It was a sheer delight attending the festival. I have already booked my flight tickets in advance and would be taking flights to Prague to attend the Czech Beer Festival being held from May 16 to June 1, 2013. Don’t forget to attend this exciting and interesting festival!